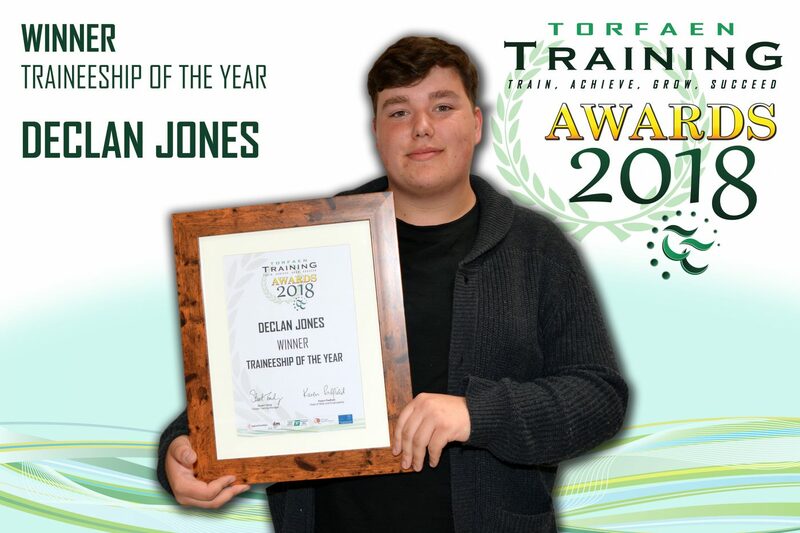 Declan Jones from Monmouth won the Torfaen Training Traineeship award for 2018, this is his story with the Work Based Learning Programme…. Declan struggled in school with low self-esteem, a lack of confidence, constant bullying and staying engaged in mainstream education. He joined to the Inspire2Achieve (I2A) programme in Year 10 while at Monmouth Comprehensive School, and had a keen interest in supporting young people. A referral was made to Careers Wales which led to an extended work experience placement for one day a week at Overmonnow Primary School. Declan engaged well in one-to-one I2A sessions and completed a level 2 BTEC certificate, as well as building his confidence, improving his attendance, and completing his year 11 studies. On leaving school Declan could not face college, and so he approached Amanda Edwards who runs the Work Based Learning course in Monmouth. The programme was able to offer Declan a qualification, and support to build his skills and confidence. 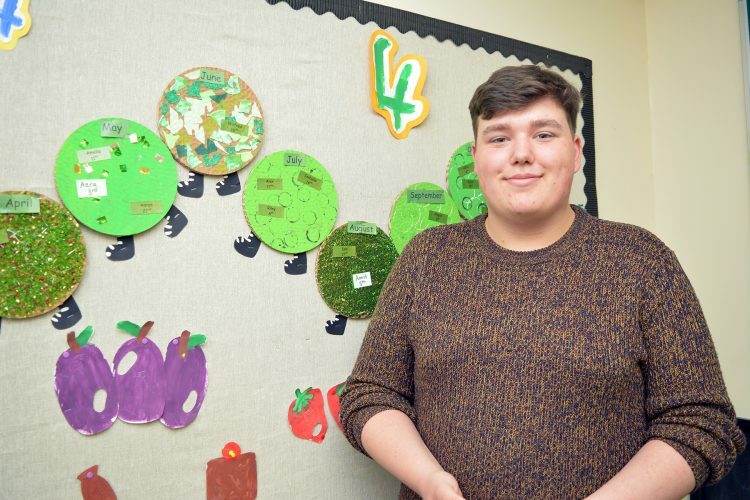 As part of the programme, Declan was able to secure a placement within a Nursery Classroom at Overmonnow Primary, where he has learnt many new skills. This includes learning sign language, which he has used to communicate with many of the young children. Declan can now lead group sessions and one to one work, and is able to work within a team or on his own initiative. He has learnt how to communicate with people, work within an established team and develop a personal progression plan with short term and long-term goals. Healthy eating and a healthy life style has had a huge impact on Declan and doing this unit within the qualification inspired him to look at his own lifestyle realistically, with great results. Declan has created an active CV, which is re-visited whenever he feels apt; this includes to add the new skills and qualities he is learning on a daily basis, and his progression. Declan was able to prepare for placement with help from his tutor and group sessions, and set realistic goals to work towards in placement. This also enabled him to ‘learn from placement’ and use reflective practice. Through the traineeship programme, he has also been able to use Health and Safety in the workplace to identify risks and hazards. Declan is now aware of good conduct in the work place and can carry out reviews and reflect on them. 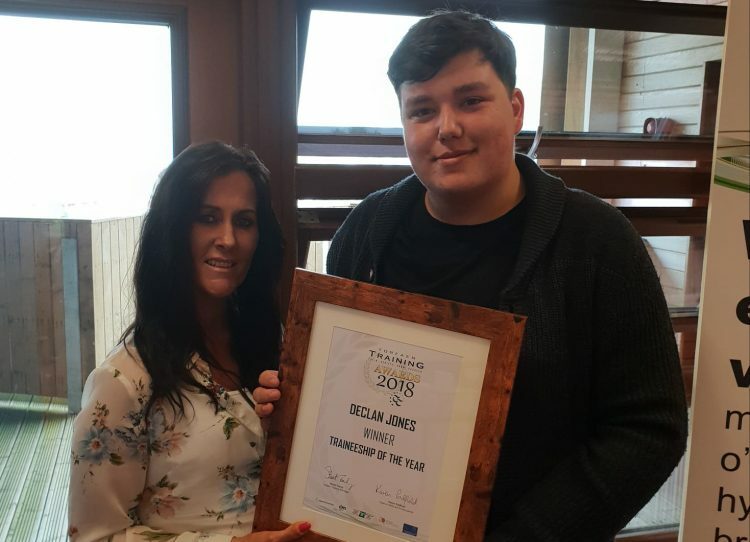 Declan’s Tutor, Amanda Edwards said “The most amazing thing I’ve observed since working with Declan is his mature approach in his personal behavior towards success. Declan has now secured a Level 2 Apprenticeship in ‘Early Learning’ for September in the Nursery at Overmonnow, which he is very excited about. He has now been put forward to the Apprenticeship National Finals and is waiting to see if he has been nominated. Declan has been amazing and has overcome so much within his self-being. He is more confident, out spoken and assertive which is something that has amazed a lot of people. From someone who could not face college – what a turn around.